3. Remove from the stove and wait for a while for the mixture to cool down a bit. 4. While the mixture is still warm, place mixture on a plate and divide it into eight pieces. To get a nice even shape, place the divided mixture into round cookie cutters. The mixture should be roughly 2-3cm thick. 5. Press the mixture on the top with either your fingers or the back of a teaspoon to make the nest. Leave to cool and set aside. 1. Place the leeks and mushrooms in a nonstick frying pan and sprinkle with salt. Cook until the leeks become soft. If necessary add 1-2 Tbsp of water. 2. Add the oil, tomato sauce and mix for 10 seconds. 3. Mix the flour and 1/2 cup of water in a separate dish and then add to the sauce. 5. Take the cooled down polenta nests and a little feta cheese to each nest, next some sauce and then some more feta to complete the dish. 6. 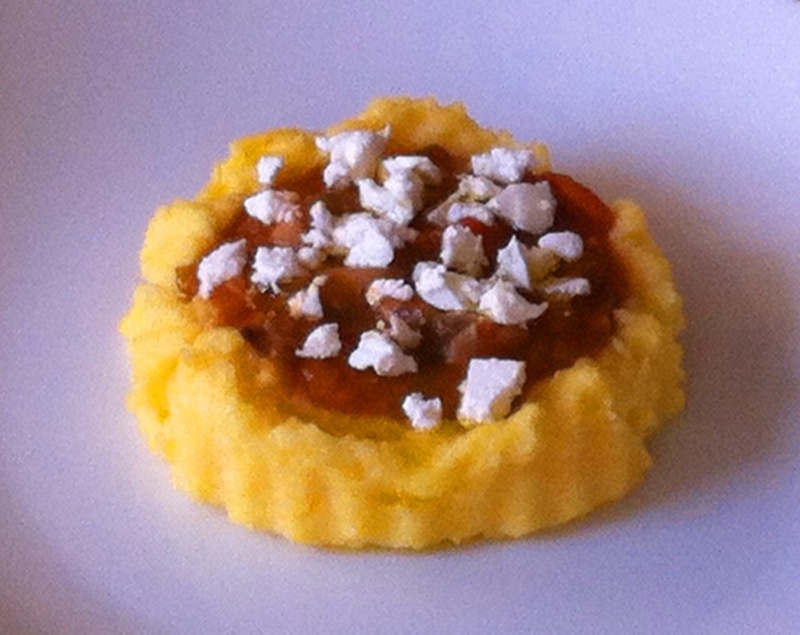 Enjoy the Polenta Nest’s cool or hot!